Clearlink is in the business of conversion: turning casual scanners into repeat customers. One of the main ways we achieve this is through content marketing. While our priority is using our marketing expertise to convert customers for our brand partners, we use our expertise internally as well. Our internal “customers” are the sales professionals who do the heavy lifting of sales and consumer support. Offering content experiences that causes them to think, learn, experience, and change is becoming a fundamental way for us to support their needs. Based on our experiences creating a training curriculum, here’s how you can use content marketing strategies to train your sales professionals. One of the core tenets of content marketing is digestibility. Long-form content is great, but you need to chunk it up in short, digestible bits to keep your reader engaged until your final CTA. Chunking also helps improve readability and increases memory recall for your audience. The Clearlink training technology team is focused on supporting the skill development and goal attainment needs of a largely millennial workforce. We accomplish this by providing rich video, video streaming, audio and other short, shareable content experiences through an proprietary tool we call Succeed. 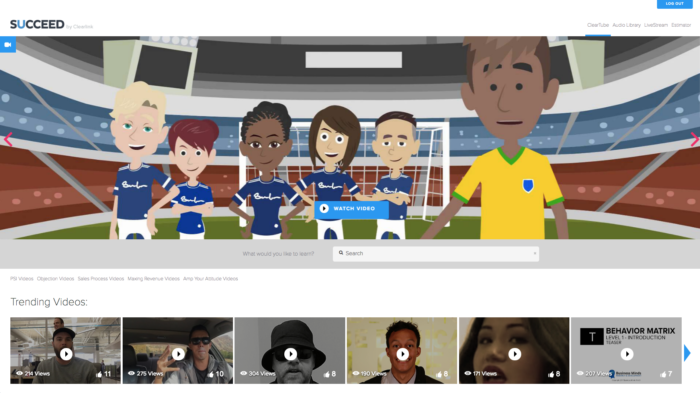 Succeed’s purpose is to deliver user-generated and curated video-, audio-, and text-based content through “just-in-time” micro-learning strategies. With Succeed, Clearlink sales executives can access digestible content the moment they need support to close a sale or to quickly learn a new sales technique. Users have access to dozens of topics—from objection handling, cross sales, sales process, closing sales, adding products, qualifying consumers, data entry, system upgrades, policy changes, sales incentives, etc. The majority of the content is less than 120 seconds long, making it short and to the point. Since Succeed’s launch in August 2016 the site has logged nearly 80,000 page views, over 30,000 video views, and thousands of audio file interactions. There are countless anecdotal evidences of individuals reaching sales goals due to searching, consuming and implementing sales tactics learned from audio and video content from Succeed. In marketing, it’s important to keep your messaging consistent for your users. Consistency helps you build a connection with your audience and keeps you top of mind for future needs. Our Succeed platform has been a key component of driving consistency and unity across the organization via our livestream. The livestream has enabled us to broadcast live events to our three campuses and to all virtual work from home employees at the same time. This way, all of our agents are able to access the same information at the same time, no matter where they work. These consistent messages and shared learnings create better experiences for our sales agents and our consumers. Our agents feel more like a team and are able to provide consistent messaging back to our customers. Consistent messages and shared learnings create better experiences for sales agents and consumers. When your agents feel more like a team, they are able to provide consistent messaging back to your customers. In addition to improving team unity, livestreaming has also helped us improve attendance. The Weekend Lotto, for example, allows agents who work a full weekend shift to participate in a livestreamed lotto with cash prizes. This weekly livestream has reduced Clearlink’s weekend absenteeism by nearly 30%. Knowing your audience means knowing their triggers. Once you know their triggers, you can personalize your content to promote further action. Whether it’s telling a story, offering a solution, or building anticipation, personalized content helps you and your audience meet your goals. In 2018, Clearlink’s training technology team will focus on creating individualized content recommendations for our sales agents. While this is not a new concept in the video sharing world, basing those content recommendations upon individual performance needs is unique. 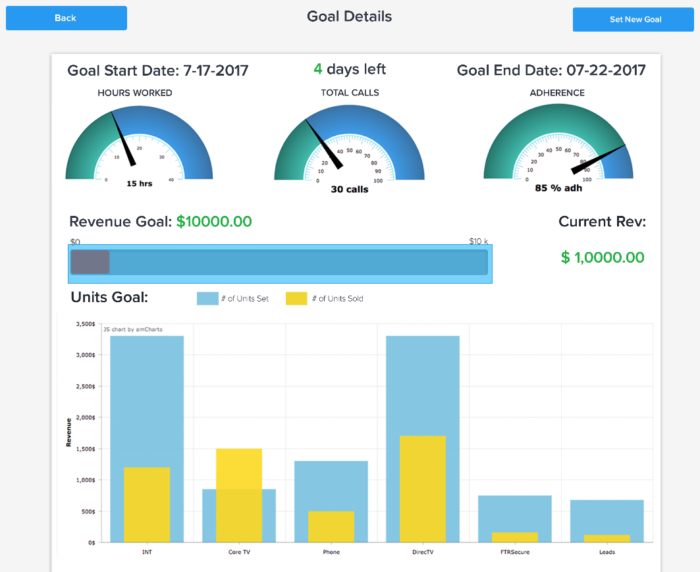 With Succeed’s current Commission Estimator function, for example, Clearlink sales executives have the opportunity to set weekly sales goals to produce a real-time estimate of their weekly commission. These estimates help agents better gauge their own performance and push agents to work harder and earn more. Our intention is to take this functionality one step further and allow Succeed to evaluate agents’ goals against their actual performance. Based on that, we can provide content suggestions to help the agent learn the skills necessary to reach their goals. The Clearlink training technology team is also poised to deliver a unique training feature called Fuse later in 2018. Fuse will be able to analyze sales agent skill levels and assign and measure training task completion rates, providing additional personalized learning opportunities for our agents. This exciting tool will be an important link in the training ecosystem that ensures sales executives the most timely support and training necessary to increase consumer conversion rates. We believe that each person we hire has the potential to succeed in both their personal and professional lives. As this is our belief, our training strategy is to surround each Clearlinker with an ecosystem of tools, content, knowledge, experiences, and support so the needed skills emerge and develop. By viewing our employees with the same experience-centric focus as we do our customers, we can make them feel engaged, appreciated, and more productive. It’s a way to lead by example, so they can pass that same experience on to the people they interact with every day. Find out more about Clearlink’s intelligent sales solutions and the technology behind our performance-based sales center. Garrick Greenhalgh has a demonstrated breadth of experience in all aspects of the training function gathered over the past 15 years. 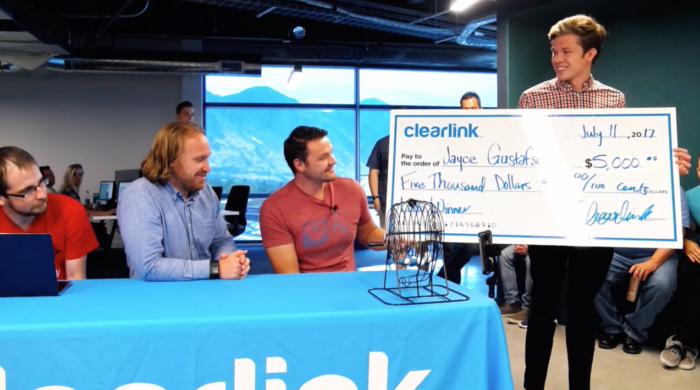 Passionate about finding answers and creating solutions, he leads a team of developers to create applications that provide customizable access to content and learning as the training technology product manager at Clearlink.